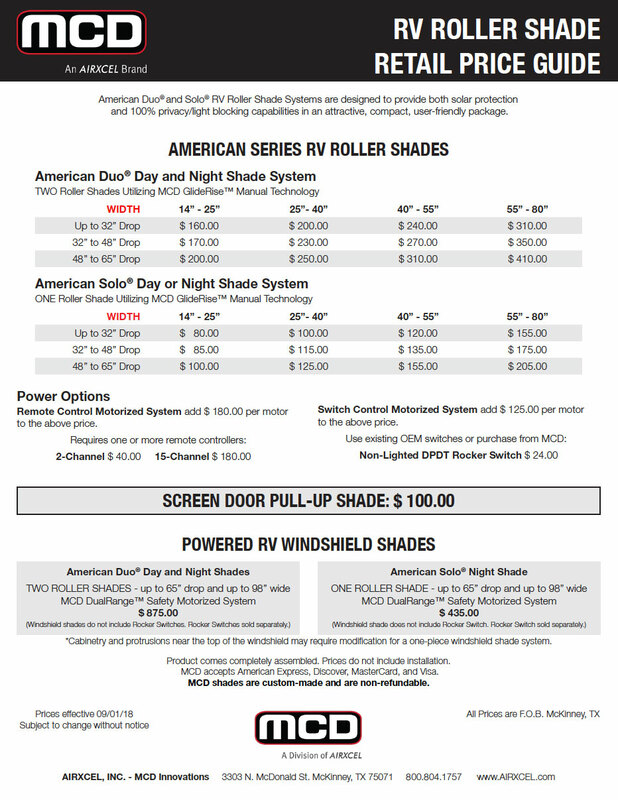 Update your RV this year by installing the American Duo® Day/Night Shade System. This is the same shade system featured on 2012 and 2013 models from manufacturers including Winnebago, Itasca, Newell, Tiffin, Foretravel, Fleetwood, Four Winds, Thor, Newmar, Monaco, Holiday Rambler, Renegade, Excel, Coachmen, Forest River, Phoenix, Born Free, NuWa, New Horizons, Competition Trailers, and others. The American Duo® Shade System will be custom made to fit your existing unit. Imagine….the latest in shade technology….2013 features….in your RV. The exciting American Duo® Day / Night Shade System is an advanced window shade innovation designed to provide both Solar Protection and 100% Light-Blocking capabilities in an attractive, compact, user-friendly package. Easy to operate and easy to clean. This system eliminates the types of service problems commonly associated with conventional day/night pleated shades. This new shade product takes the place of curtains, pleated day/night shades, expensive cellular, Vienna and Silhouette shades, power visors, Venetian blinds, conventional roller shades and other dated shade efforts. The Day shade utilizes MCD’s exclusive ClearView II™ Solar Sun Screen to provide superior outward visibility, unsurpassed daytime privacy, and outstanding heat protection. 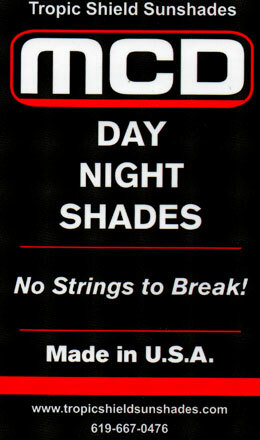 The Night Shade is 100% Light-Blocking and is available in different colors, patterns, and fabrics to complement any décor. Power and manual versions are available.